5 Tips to Keep Your Pipes From Freezing During Winter Storm Grayson - T.Webber Plumbing, Heating, Air & Electric. The Hudson Valley has been experiencing arctic temperatures since before Christmas – but mother nature is not done yet. As Winter Storm Grayson works its way north, forecasters are anticipating it will get worse before it gets better. Over the weekend, temperatures are expected to be 20 to 40 degrees below normal with “real feel” temperatures reaching 20-30 degrees below zero in some parts of upstate New York (Brrrrr!). These arctic temperatures, paired with damaging wind gusts of 40-50 mph, create the perfect storm for frozen pipes and property damage. The possibility of downed trees and widespread power outages only compounds these troubles, as access to heat and electricity could become jeopardized. Tip #1: Keep your heat cranking. Now is not the time to turn the thermostat down and worry about energy conservation. Make sure you leave the heat on – at least above 68 degrees – all day and all night. Leaving the house? Keep the heat on. Going to bed? Keep the heat on. If you are having issues with your heating system and are unable to keep your home warm throughout all zones, please call your heating contractor IMMEDIATELY. Failure of heating systems during freezing cold spells can cause extensive damage throughout the entire home. Many pipes are located in cabinets (in the kitchen and in the bathroom). T.Webber recommends keeping these cabinet doors open to allow heat from the rest of the home to keep these pipes warm. It’s also a good idea to leave all doors throughout your home open to ensure heat is properly circulating throughout the property and there aren’t any cold spots. 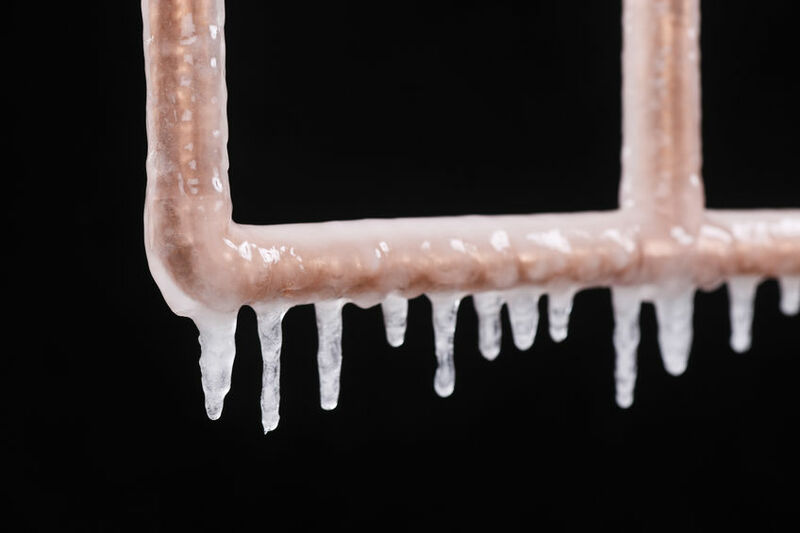 Holes, cracks, and drafts can let damaging cold air into your home, causing pipes to freeze. Wherever possible, seal up any leaks: close off any crawl spaces, fix drafty windows, utilize draft stoppers around doors and windows, etc. This will help keep the damaging cold air outside where it belongs and let your home remain safe and warm. It’s inevitable that some pipes will always be less protected than others – those in the basement, on exterior walls, or under mobile homes are especially prone to freezing. Wrap exposed pipes with insulation, or consider utilizing heat tape. Simple but effective: let your faucets drip. By allowing water to drip slightly from your faucets, you can eliminate the pressure created between the frozen blockage and the faucet. This pressure relief can help keep pipes from bursting. Even if the precautionary measures outlined above are followed you may experience a frozen pipe. If you’re a Hudson Valley homeowner who experiences a pipe freeze over the next few days, here’s what we recommend doing. When pipes freeze it is important that you act quickly to thaw the pipes before they burst from pressure and cause damage or possible flooding. Just because a pipe is frozen doesn’t mean it will burst – but it is important that it’s thawed as quickly as possible to minimize damage. Step #2 Attempt to heat up the affected area. Use portable heaters, electric heating pads, or hair dryers to attempt to warm the pipe. Start by warming the pipe as close to the faucet as possible, working toward the coldest section of pipe. CAUTION: Proceed with caution with any electrical appliances around water and do not leave any space heaters unattended. Space heaters should be kept away from flammable materials. Please DO NOT use blowtorches or other open flame devices to try and thaw your pipes. Water damage is preferable to burning down your house! Please also be very careful if you attempt to thaw the pipe on your own. If the pipe has been compromised (cracked or burst) you may experience leaks upon thawing – know where the shut off is to prevent flooding. If your water pipes have already burst, turn off the water at the main shutoff valve in the house; leave the water faucets turned on. Make sure everyone in your family knows where the water shutoff valve is and how to open and close it. Call a licensed, professional plumber (like T.Webber) to help thaw and repair your burst pipes. If you cannot locate the frozen pipe, or it is not exposed (in a wall, in the ground, in the ceiling) – we also recommend calling in a professional. In the event you do suffer from frozen or burst pipes, T.Webber Plumbing, Heating, Air & Electric is available to assist in all phases of repair – from pipe thawing to repairing broken water lines and heating loops. In the meantime, stay safe and warm!